Today, I'm taking Friday Fragments to the extreme. I'm sure our hostess, Mrs. 4444s, won't mind. First, let's start with an extreme Christmas tree. It's my brother's tree. 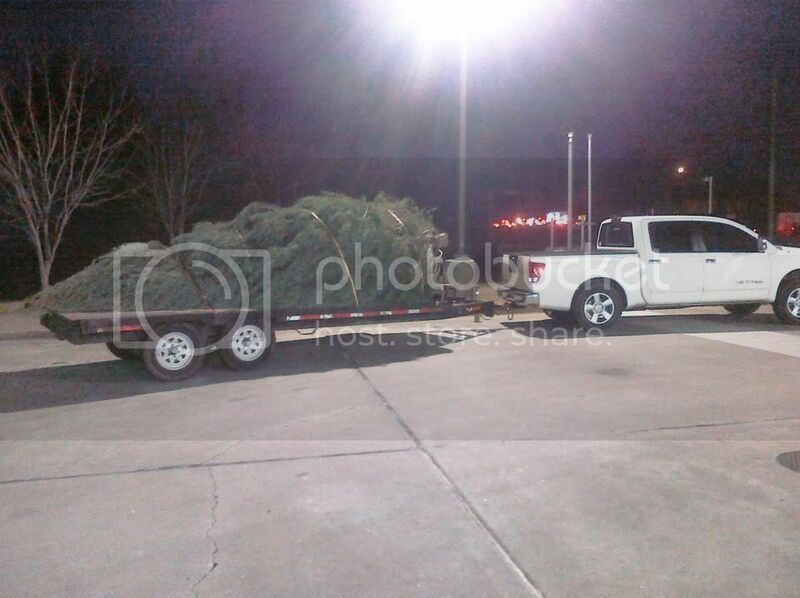 Why yes, that is a flatbed trailer he's using to haul the tree to his house. 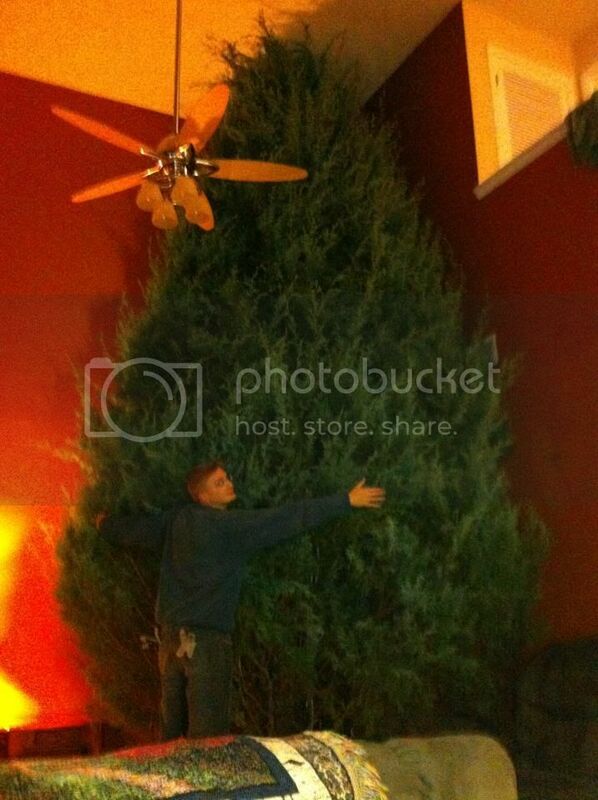 And yes, that is his 6-foot, 4-inch friend standing there dwarfed by the tree. Is that awesome or what?! Then let's throw in some extreme temperatures. Today is December 15. The high here today was 59 degrees! Holy tropical heat wave, Santa! For extreme temps of a different sort, this time last week I was running a temp of 103.8 degrees! I think that is the sickest I've been in my adult life. I feel much better now, though I've had some extreme bedtimes trying to get my energy back. How's 7:45pm and 8:30pm grab ya? AND, I slept all night long! Terrible for getting things done, but awesome for the body. This weekend, we're going to be doing some extreme housecleaning. We have a dumpster scheduled to arrive tomorrow. I'm giddy at the thought of just pitching so much STUFF. Finally, my extreme hairstyle is scheduled to appear next Wednesday. I was supposed to have it done last week, but that's when I was sick, sick, sick. And now, I am extremely tired and ready for bed. Have a good one! Gotta love the warm temperatures for December! That is one very BIG tree! The only thing I could think of was, maybe he watched Christmas Vacation with Chevy Chase recently? LOL! I love it! 'Little full, lotta sap"
That's an Extreme tree. I am extremely impressed. Oh I want that tree!!! We have a huge entry way that I have been begging to fill with a tree!! I am so glad you are getting better and clearing stuff out!! Looking forward to the pic of the new hair style on you! That tree is amazing! Woah! I can't even begin to imagine how you decorate it. I love your extreme fragments. Very funny! I'm glad you are feeling better though. I wanna see that tree all decorated! How do I find "Idunno?"